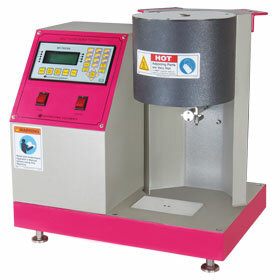 As per ASTM D 1238 & ISO 1133 – (Test Method A & B) to check the melt flow rate (MFR) & melt volume rate (MVR) of thermoplastics and compounds with automatic result. Micro processor based PID controller with temperature range from ambient to 400ºC, resolution of 0.1ºC and accuracy of + 0.1ºC. Timer : Digital presettable with a range up to 59 minutes, 59 seconds. Temperature controller : Micro processor based auto tuned PID controller with temperature range from ambient to 400ºC, resolution of 0.1ºC and accuracy of + 0.1ºC. 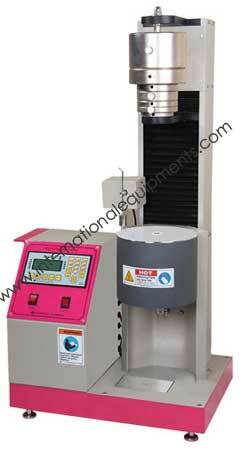 Specimen Weighing : Automatic up to 60 gm and resolution of 1 mg. 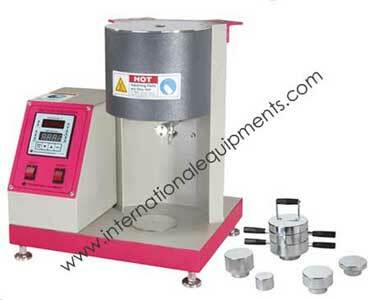 Weight : 1.2 kg, 2.16 kg, 3.8 kg, 5 kg & 21.6 kg hard chrome plated Weights. Digital Display : Individual MFI result with average results facility. PC output : Through serial port with Window 7 compatible software. Power Supply : 230 Volts, 50 Hz, Single Phase. Accessories : Orifice, Piston, Spoon, Spanner, Plumb line, Funnel, Material charger, Mirror, Tweezer, Orifice cleaner, Barrel cleaner, Sample cutter and Accessory stand.